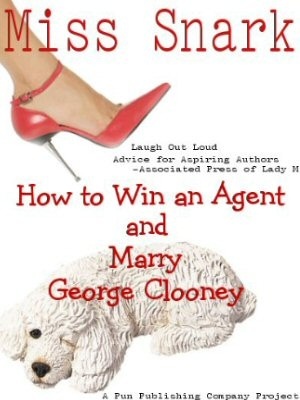 Miss Snark, the literary agent: Miss Snark Gets Advice! I recently received a rejection letter from an agent who I really wanted to work with. The agency has a fantastic reputation and all the agents are making sales in my genre. Would it be a waste of my time to query another agent at that agency? The form rejection letter I received stated, "We are unable to offer representation." The word "we" was used throughout the letter. Am I to assume that none of them will be interested in my project? Do agents ever meet together and make determinations about what the agency as a whole would like to represent? Thank you for sharing your wisdom. Well, one of the hallmarks of wisdom is knowing what you don't know, and I don't know much about querying other agents at the agency cause the only other one here is KY and he's busy taking a bite out of the slush pile most days ..but not quite the way I'd hoped when I promoted him to assistant. There are no hard and fast rules about submitting to more than one agent at a multi-agent agency except one: don't submit to more than one of them at a time!!! My advice to this person would be to e-mail the agent who rejected them and ask if they mind if they query another agent in the agency. If they get a yes, or no response, they should go for it. BUT, when they query the other agent, I think it is only the right thing to do to mention that they were turned down by the other agent, and they should name them. At Trident, for example, if I was told by a querying individual that John Silbersack turned them down, that wouldn't prejudice me, because I know that John and I do very different kind of books. Even if I knew Kim Whalen turned them down, that wouldn't make a difference, because even though our lists are similar, we have completely different tastes and often pass projects back and forth. If we think something might be right for one of our colleagues, we'll generally put it before him or her. So, chances are you'd be duplicating your effort and wasting postage. We won't drum you out of the aspiring writer biz, but we may take a mental note that we've had to duplicate our efforts as well. 'Cause even giving something a quick read to realize that we've seen it before takes time (opening the envelope, giving it a look, stuffing the return envelope). It doesn't sound like much, but when you receive one hundred to two hundred queries per agent per month...well, it does add up! So there you have it. No hard and fast rules, but you'll want to check before you send to someone else, and mention it's been there before. Now, Miss Snark is off to query the gin truck delivery man about an emergency delivery. And sometimes it pays to take chances. I sent a query to a particular agent and got back a request for a partial from a different agent than the one I queried. Figuring the first agent passed it on, I sent the partial back to the second agent and was ultimately rejected. Then the original agent I queried left to open her own agency. Taking a chance, I emailed her, told her the story and asked if it was normal practice to pass queries to another agent. She didn't remember reading my query, so she asked me to email it to her. After reading it, she was certain she'd never seen it and asked for the partial. Now she has the full. If I hadn't taken the chance and asked her about it, I wouldn't now have her reading my full ms.